Previous winners: 2012 – Bradley Wiggins. 2013 – Peter Sagan. 2014 – Michal Kwiatkowski. 2015 – Peter Sagan. Sheree: Sagan smashed the myth of the curse of the rainbow jersey in 2016 with 15 victories (and a further 18 podium places), which included his first Monument, The Tour of Flanders, his fifth consecutive green jersey at the Tour de France, a first yellow jersey at the Tour, top step of GP Quebec, the star-laden jersey of the European Champion and back-to-back victories at the World Championships. No wonder he was also UCI top dog! But it’s more than that, 2016 has been Sagan’s coming of age. He’s matured, he’s more tactically savvy but he’s still prepared to gamble all in order to win big. The professional peloton needs the swashbuckling style and spectacle that is Peter Sagan. Ant: My Rider of the Year is Dan Craven, not for races won, or epic performances, but for the best expression of what it means to race bikes. Our hirsute hero took the opportunity to ride the Olympic Individual Time Trial (after asking Twitter if he should), a race he hadn’t prepared for, and couldn’t win even if he had, on the wrong kind of bike, just because he couldn’t NOT race for his country and for his fans. That’s my kind of bike racer. 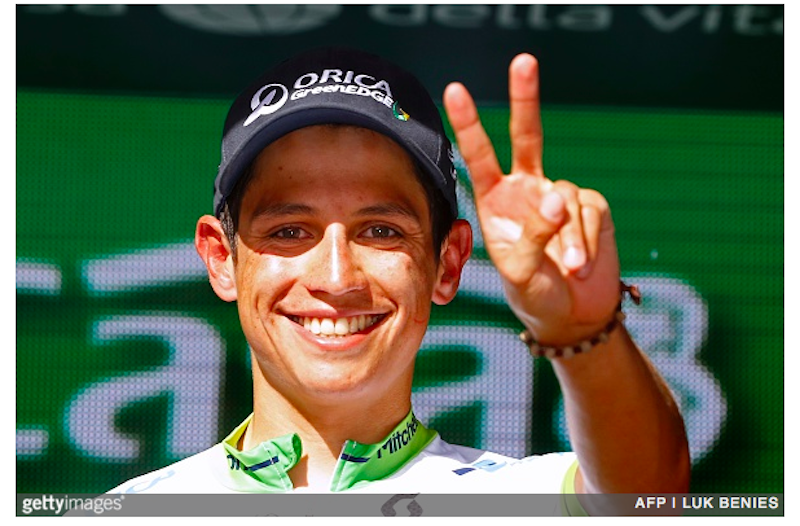 Kathi: Our breakthrough rider last year, Esteban Chaves has kept the faith this year. With two Grand Tour podiums and a Monument under his belt, this was a huge season for the little kangaroo. The brightest smile in the peloton might blind a few people to his steely will on the bike, however. His cool head and keen eye, backed up with unwavering support and flair from his Orica-BikeExchange team, saw him take Giro stage 14, don the pink jersey after stage 19, and hold for the second step of the final podium. He also out-Contadored Contador on stage 20 of the Vuelta to muscle his way onto the third step of the final podium and topped off his season by being the first Columbian to ever win a Monument, the beautiful Il Lombardia. Midge: There has been one rider who is just winning me over … and it’s Movistar’s Alejandro Valverde. I know!! But see, here’s the thing that impressed me this year: as well as being on song for most of the season, every season, at the age of 36 he’s still adding new awards to that already impressive palmares. 2016 saw him line up the Giro for the first time and, despite a terrible day in the Dolomites, he battled and scrapped to finish third overall – giving the Spaniard a grand slam of Grand Tour podium places. And in an unlikely turn of events, I think he played fair in his dealings and support for teammate Nairo Quintana in both the Tour and the Vuelta. I may need to lie down now. Panache: I’ve never really been a big Chris Froome fan but the 2016 Tour de France changed that. Froome seemed changed. He attacked when no one expected it. He gave us the super stork tuck (don’t try that at home, kids!). He attacked in the wind with Peter Sagan. He didn’t just sit wheels and stare at his power meter… he took the race by the scruff of the neck and showed the world why he is the best Grand Tour rider in the world. This will come as no surprise to anyone – Peter Sagan took 53% of the vote; the little kangaroo came in second with 24% of the vote. Dan Craven, Chris Froome and Alejandro Valverde finished third, fourth and fifth. I wonder if Sheree had to win some kind of office duel to write up Sagan…. I was also happy with Cav’s return to form but Sagan was this year’s news.